The multidisciplinary initiative will recruit 10 faculty members from eight campus units. Faculty will collaborate on areas related to disability, including how people define and respond to disability and the critical areas of technology, education and employment. “It’s meaningful that this is happening here at Berkeley,” said Susan Schweik, a UC Berkeley professor of English and associate dean of arts and humanities, who has carried the torch for disability studies on campus for several decades. “Disability studies are a young field, an emerging field, but we were one of the first in the mix.” Also, the new disability research initiative will be housed in the Haas Diversity Research Center, which has broadened its programs and mandate as part of the UC Berkeley Initiative for Equity, Inclusion and Diversity launched in 2010. 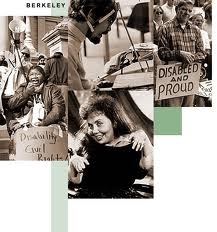 Berkeley is where the disability movement started – where persons with disabilities legally defined rights and control over their own lives. No longer content with limited life opportunities, nor willing to be defined solely as medical patients, disabled people in several cities nationwide shared the willingness to challenge authority, discard received wisdom, and effect societal change that was the hallmark of the 1970s. Blue-curb parking spaces, accessible buses, sign-language interpreters, ramps to buildings, braille elevator buttons, and much more, were to become ordinary within a short few years. About 30 universities nationwide offer disability studies, with only a few — including the University of Illinois and Ohio State University — offering graduate programs.